My hometown of Windsor, Ontario Canada (and the surrounding Essex Country) is often a McDonald's test market for Canada (and sometimes for all of North America). In the past, we were the first (and I believe only) McDonald's market in North America to deliver. We were the first also McDonald's market to have Pizza (which never made it out of Canada), and the first to start the McCafe changes in North America. The McMini is also another Windsor-first. But at the time I sampled, they had gone nationwide. Back in 2010, McDonald's Canada offered two options, grilled or crispy chicken, for each of their two flavours, Thai Chilli, and Pesto. 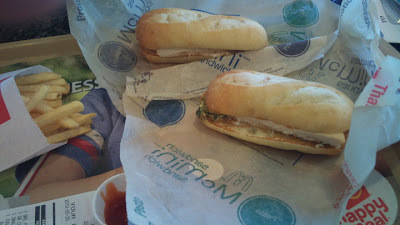 Each consisted of 1/2 a chicken sandwich on a mini-baguette with the topping, and garlic mayo, regardless of your combination, it was only $1.99CAD each. Cheap on the wallet, and cheap on the waist, as each sandwich only had ~230kcal. I guess they were intended for the dieting market. The Thai Chilli was more sweet than spicy, actually, it wasn't spicy at all, and the pesto was a bit watery, but still decent. In retrospect, I probably should have tried the Thai Chilli on the crispy chicken. I guess in order to keep costs down, they do not include any veggies on the sandwich, and I think even a simple pieces of lettuce would have made it even better. I just checked www.mcdonalds.ca and they are still on the menu, but it seems you no longer have the grilled chicken option, only the crispy chicken. Also, Pesto has been discontinued and replaced by 'Zesty Mango', which doesn't sound over appealing, but I will give it a go on my next trip home.